A proven and unique combination of learning principles and exercises, this highly acclaimed book continues to get better! 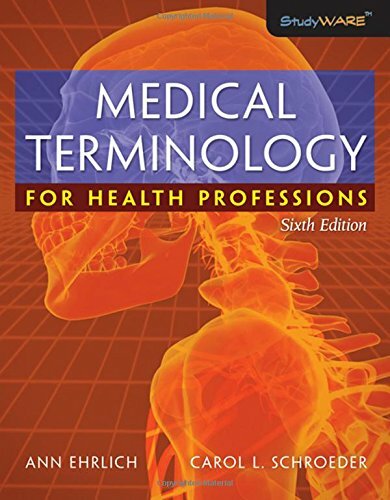 Medical Terminology for Health Professions, Sixth Edition, simplifies the process of learning hundreds of complex medical terms. The See and Say pronunciation system makes pronouncing unfamiliar terms easy. Because word parts are integral to learning medical terminology, mastery of these "building blocks" is emphasized in every chapter. Organized by body system, chapters begin with an overview of the structures and functions of that system so you can relate these to the specialists, pathology, diagnostic, and treatment procedures that follow. Learning Exercises in each chapter offer a variety of formats that require written answers. Writing terms reinforces learning and provides practice to help master spelling and enhance comprehension.